That was all I needed to know. The line has such immense authority. The rhythm is simple and powerful, and signals that you are in the hands of an author who knows how to craft a beautiful sentence. And it perfectly sets up the next paragraphs, in which those headlights shine on dead bodies. That too signals something—that matters of life and death are at stake here. I bought the book on the strength of that first line, which is the opening sentence of Gorky Park by Martin Cruz Smith. A thousand times while I was writing Wire to Wire, I read and reread that sentence to myself. ‘Try to get something just half as good as this,’ I would tell myself. As openings go, that line set the bar for me, and still does. Earlier tonight, I met Martin Cruz Smith at Powell’s in Portland. His new book is called Tatiana. The character of Tatiana was inspired by the journalist and human rights activist Anna Politkovskay, who was murdered—assassinated—on Vladimir Putin’s birthday in 2006. My son, Zane, has been in Ukraine and Russia for a semester abroad, and because of his interest in Russia and journalism, I knew he’d be fascinated by this story, as am I. 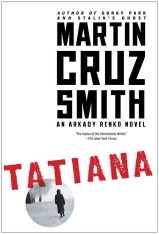 During the Q&A, I asked Smith what first inspired him to create a Russian detective, particularly since Gorky Park was written at a time when it must have been extremely difficult to research political and police matters in the Soviet Union. Smith said he had gone to Moscow to write a story about an American detective who was teaching the Russians how to investigate a murder, but realized that he was trivializing what could be a great story. The detective, he decided, had to be Russian. That, of course, changed everything. And yet, the publisher wouldn’t give up the rights. So Smith simply didn’t deliver any more pages. The standoff continued for seven years until the editor left. “And by then, I was a much better writer.” So, in an odd sort of way, the delay was useful, and he is somewhat grateful to the editor, Smith said. Maybe because of my own slow journey, I loved that story. When I talked with Smith briefly after his reading, I told him how much Gorky Park meant to me and I had him sign a copy of it along with a copy of his new book. On a cold night in Portland, Smith was charming and warm. I’m looking forward to reading Tatiana. All nights should be this dark: Amy Cook, "Airplane Driver."